Fortnite fans who are also members of Twitch Prime have for a while now enjoyed access to a small selection of exclusive and free goodies through the not-so-imaginatively named Fortnite Twitch Prime Pack. 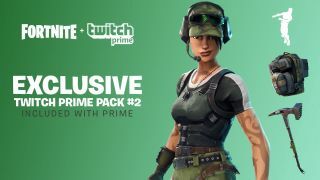 Now, Epic Games and Twitch have announced there’s going to be even more free loot for Twitch Prime subscribers to get their hands on with the Fortnite Twitch Prime Pack 2. Launching on May 9, this new pack contains three exclusive items for Fortnite’s Battle Royale mode including the camouflage-heavy Trailblazer Outfit, the True North Back Bling, and the Tenderizer Pickaxe. There’s also a brand new dance emote for those that like the dance floor as much as the battleground. The pack can be claimed through the Twitch Prime announcement page, where it’s also explained that while the pack can only be claimed on a single platform, it can be shared across PC/console and mobile as long as you use the same Epic account across these platforms. You can’t however, share your loot across PS4 and Xbox One even if you are using the same Epic account. If you’re already an Amazon Prime member, getting Twitch Prime is as simple as linking your Twitch account to your Amazon account after which you’ll get access to these Fortnite goodies as well as a handful of free PC games every month.